If an open floor plan is on your wish list but a full remodel or renovation isn’t possible, consider incorporating these tips into your interior design. Modern trends in residential architecture and interior design have moved toward open floor plans, allowing spaces to seem bigger and to flow for easy entertaining. If you live in an older home, however, chances are it includes a variety of smaller rooms rather than one large continuous space. This now-dated approach to residential design allows for efficient heating and cooling, but it may not be doing you any favors in terms of flow and connection between the spaces. Some homeowners decide to move toward the more desirable open plan through a renovation involving the removal of walls—often with the help of a structural engineer and a mess to boot. This option clearly is not possible for everyone. So how can you create the feel of an open floor plan even if your home doesn’t have one? Beautiful Habitat owner, Tennille Wood shares, “While an older home may not have an open floor plan, it usually has some character elements that can be repeated, like unique moldings and trim or brick walls.” Highlighting the shared elements, either in adjacent rooms or throughout the property, connects the spaces. Read on as we share five interior design concepts to achieve the open floor plan feeling without a major remodel. And no, you won’t need a structural engineer or a hard hat. Regardless of the material choice, a clean appearance between rooms pulls the rooms together and makes the space feel more connected and open. While hardwood flooring is a popular, timeless choice, any materials fitting to the period and style of your home as well as your family’s needs and lifestyle will work. 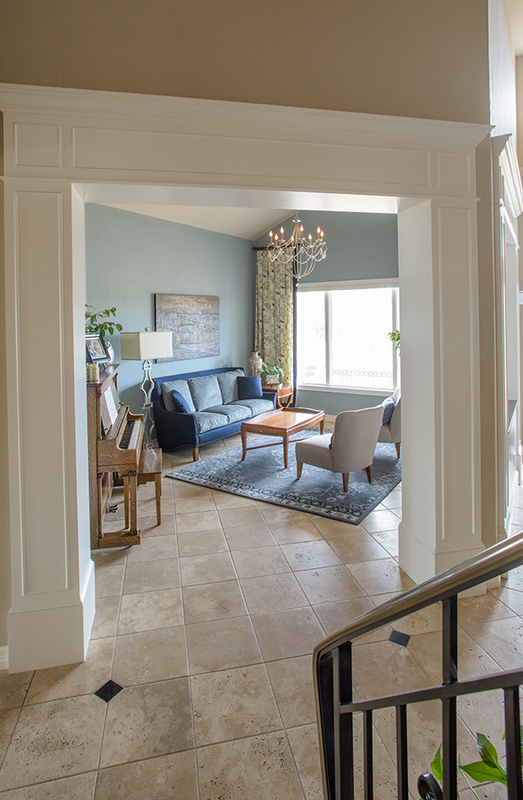 Large tiles add a clean sophistication to this foyer, living room, and formal dining room while unifying the three spaces and beautifully complementing the home’s blue and creme color scheme. A single color palette or shades of those colors appearing throughout your home give a cohesive feel to the design. This can be achieved with paint or wall coverings, window treatments, furniture or accessories. The flow-through color needn’t be a neutral grey, white or brown. As shown in this dining room, living room and bedroom, shades of blue, green, white and coral repeat in different hues and textures to create a common theme across multiple rooms. The variation on those colors keeps the space from feeling too overly coordinated but similar enough to appear cohesive. Just as continuity of color can tie two or more rooms together, architectural elements that have texture can bring unity as well. “Repetition of elements is the key to creating a cohesive home,” says Wood. “Those elements can include built items like flooring or brick walls as well as decorative elements like color and texture.” One of the major elements of interior design, texture refers to how a surface looks and feels, adding interest and depth to spaces and often providing the finishing touch on room design. While textiles such as drapes or pillow coverings are an easy way to incorporate texture, wall paints and wall coverings can provide a nice touch. This exposed brick in the dining room pulls through to the bedroom and mud room, adding nice continuity and openness throughout the home. The geometric pattern of the brick is repeated in accent pillows and accessories, while contrasting texture in the soft upholstered headboard and sleek padded ottoman help avoid monotony. Crown molding and trim offer a formal way to dress up a room or to designate and separate an art display or sitting area. By choosing a decorative trim pattern or the same trim color for several rooms, this can provide the feeling that the rooms are more connected and open even if they’re not. This home incorporates painted molding and trim throughout the home with a similar ribbed finish, connecting the spaces throughout the bedroom, bathroom, dining room and living room. As they say, the devil truly is in the details. Once a style is established through color and shape, carrying that style all the way to the window coverings and light fixtures really drives the continuity throughout your home. Even with a visible separation between two rooms, as with this sliding door, established themes of color, flooring, texture and all the little details carry through to both spaces, giving this home a strong open floor plan feel. If an open floor plan is on your wish list but a full remodel or renovation isn’t possible, consider incorporating these tips into your interior design. Consistency in color, flooring, texture, trim and your finishing touches could be all it takes to pull you rooms together, improving flow and openness across your home. If you get stumped or need a little expert advice, let us know. Fill out our pre-consultation form now! Looking for some open plan kitchen inspiration? Look no further! Ready for a remodel to achieve an open floor plan once and for all? Check out the benefits for a whole home remodel. Maybe some inspiration for your own whole home color revamp? Download our Luxury Design E-book which is full of ideas to get the creativity flowing.